Today, forests are under pressure from increasing demands for land-based products and services, which frequently leads to the conversion or degradation of forests into unsustainable forms of land use. When forests are lost or severely degraded, their capacity to function as regulators of the environment is also lost, increasing flood and erosion hazards, reducing soil fertility and contributing to the loss of plant and animal life. As a result, the sustainable provision of goods and services from forests is jeopardized. FAO, at the request of the member nations and the world community, regularly monitors the world’s forests through the Forest Resources Assessment Programme. 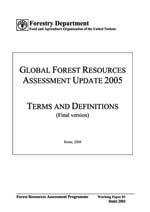 The Global Forest Resources Assessment 2000 (FRA 2000) reviewed the forest situation by the end of the millennium. FRA 2000 included country-level information based on existing forest inventory data, regional investigations of land-cover change processes and a number of global studies focusing on the interaction between people and forests. The FRA 2000 Main report is published in print and is available on the World Wide Web. The Global Forest Resources Assessment update 2005 (FRA 2005) has been requested by the FAO Committee on Forestry in 2003. The FRA 2005 will use common thematic areas of the Criteria for Sustainable Forest Management as a reporting framework. FRA 2005 will also focus on the specific conditions and issues in each country. The Forest Resources Assessment (FRA) Working Paper Series is designed to reflect the activities and progress of the FRA Programme of FAO. Working Papers are not authoritative information sources – they do not reflect the official position of FAO and should not be used for official purposes. Please refer to the FAO forestry website (www.fao.org/forestry ) for access to official information.